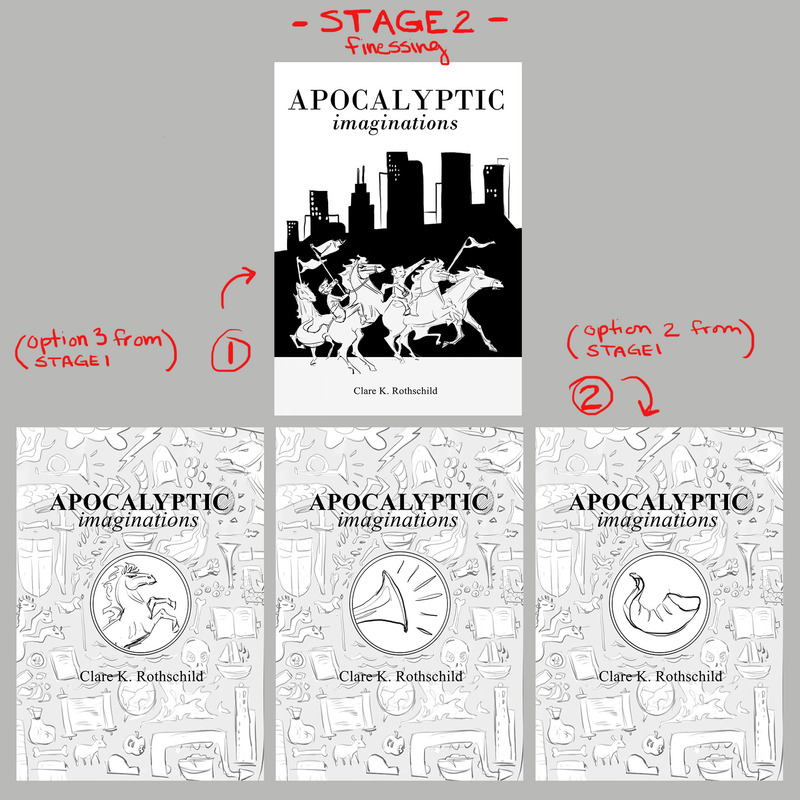 I had the opportunity a few months ago to illustrate a book cover for a book titled Apocalyptic Imaginations. With a title like that – how could I refuse… right? 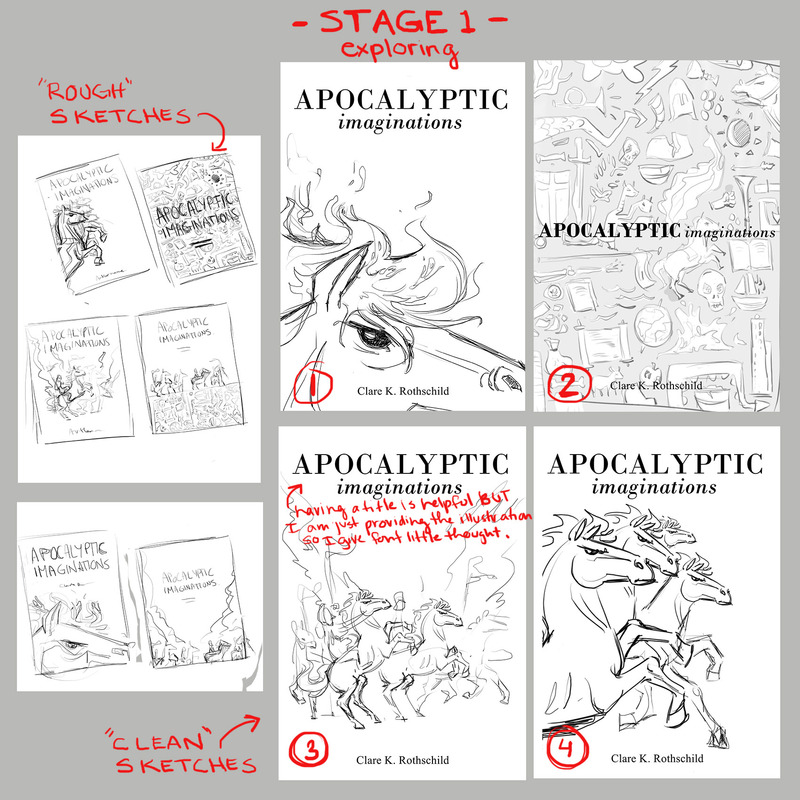 I really enjoy the process of designing book covers from beginning exploration to final execution and I thought I’d use this cover to demonstrate the steps I take when designing a cover. The cover design (just artwork) happens in four stages with three client approval/input spaces between each stage. Stage 1 – Exploration. Here, I am free to let my imagination, tethered only by my pencil, run wild. Usually I ask the author first if they had something in mind… a feeling, a color scheme, even a specific image (this just puts us on the same track -besides, guidelines often stretch imagination rather than hinder it). On top of this I read a summary of the book so I understand the content and then I just sketch, research, and then sketch some more. This is the most open part of the process and I always do it in my sketchbook because I can go to new places and draw (new spaces help me think of new ideas). After sketching for a while I pick the best 3 or 4, clean them up and then send them to the author. Approval 1: While this is the most open stage for me, it is also the most open stage for feedback. Since the sketches are rough, I welcome any and all feedback. I have invested little time in a tidy execution so I don’t mind big changes. Often the author will pick one image, but will have additional suggestions for that image – it is a time for collaborative creativity. The authors words spark new ideas for me and my drawing open up new thoughts for the author. This has always been a valuable part of the process. Stage 2 – Finessing. The great thing about waiting for client feedback is that I leave the drawing for a few days while I wait for their feedback. Usually this is just long enough that I am able to see it differently – a little more objectively – when I return to it. Next, I take the feedback from the author, add to it any new ideas I have come up with and present a few options of a single design (or 2 in this case – this process is never rigid). Now that we have selected a clear direction we are shaping the chosen image to be the strongest possible. Approval 2: At this point, the feedback I accommodate is limited – that window has passed. The changes discussed now are only enhancements and adjustments to the direction we have selected at the first approval stage. Often this is a pick and choose from the variations I have provided, or minor adjustments to a concept that could be pushed a little further. 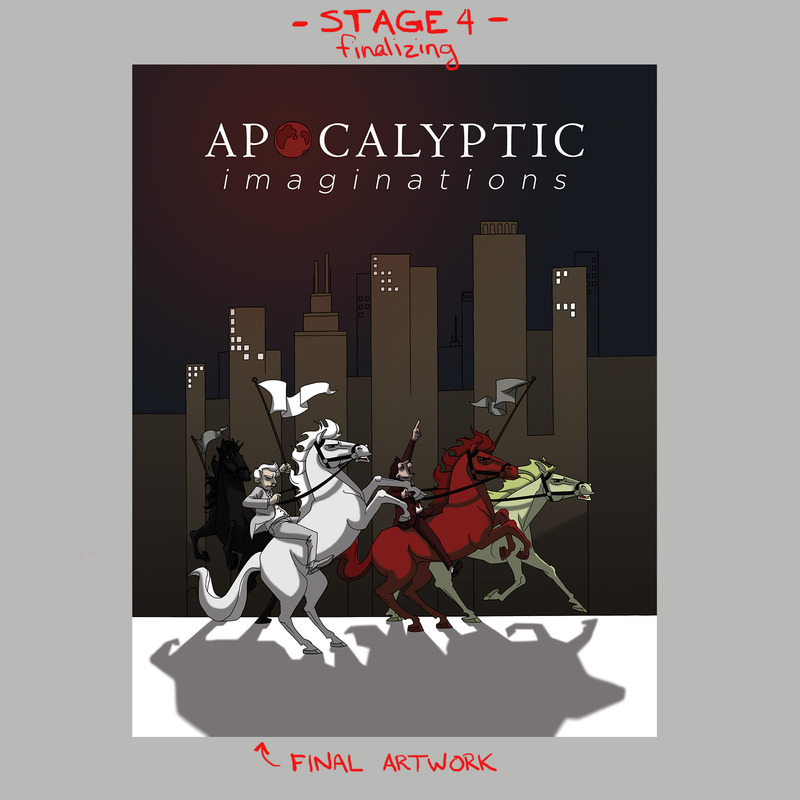 Stage 3 – Coloring. Now that the design is settled and I have incorporated the final suggestions in a single image I clean up the sketch to a final line and then shrink the image down and try 2 or 3 rough color options. Usually I invite the author into this process as well for a final round of approval. Like the initial design I will send 2 – 3 color options and let them choose a final direction. Approval 3: This is a discussion only about color. This reason I test color on the final line drawing is to show that the drawing part of the contract is done (though, of course, if something realy bugs the client about the final line work and it is not a major fix – I will adjust it as you can see in the sample). 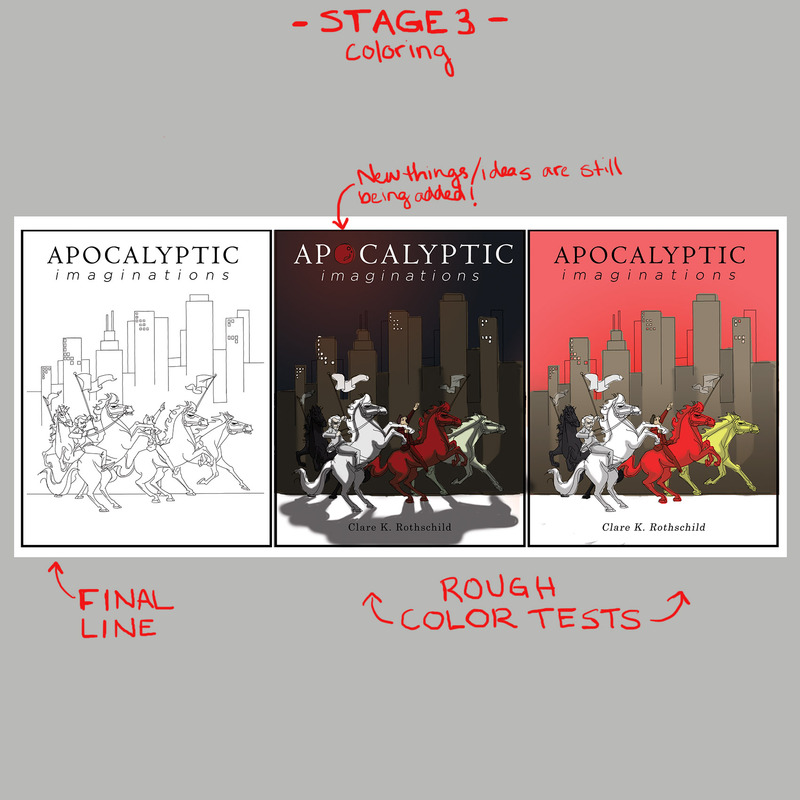 Again – like the first stage the color samples are super rough and so I can accommodate heavier amounts of feedback. (4) Finalizing. All decisions have been made now and I am free to spend the time simply executing the illustration. Often small changes are made here but nothing that compramises what has been decided already! Headphones go in, guilty pop music pleasures get turned up, and I am lost in the work for hours at a time. Now I send along the final illustration. Since there has been clear communication throughout the process (and an investment by myself and the author in all the decisions) there are no surprises. Beyond that, color always gives a big impression and so it is an exciting and satisfying last step to reveal. That’s it – the whole process. Of course keeping it within the agreed upon budget is a challenge sometime that requires me to pull away when I want to work longer or to settle for less detail when I would like to add more, but overall, cover design offers a rewarding space for work since you get to hit all of these categories just long enough to enjoy being in them!